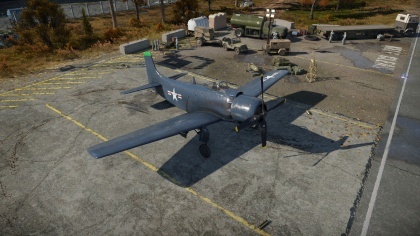 The AD-2 Skyraider is a Rank IV American attacker with a battle rating of 5.7 (AB/RB/SB). It was introduced in Update 1.49 "Weapons of Victory". The Skyraider is one of the most iconic propeller driven ground attack aircraft of the Korean and Vietnam wars. Likewise, it's armament certainly lives up to that. Even early on, the 12 HVARs you have can be devastating when used against light pillboxes and medium tanks, quickly turning a very tidy profit with a total of 8 possible launches. Generally your job is to inflict as much damage on the enemy tickets as possible, through pillboxes, ships and tanks. The AD-2 Skyraider is a high rank American monoplane attacker with a perfect combination of flight performance and payload. It has decent performance and guns, and can carry a massive payload of well over 4,000 lb of equipment, including rockets, bombs, and torpedoes. 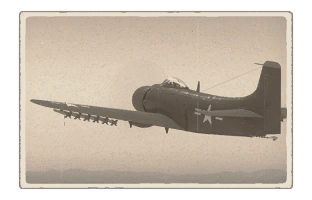 The Skyraider has a far forward cockpit, improving visibility and an airbrake capable enough of dealing with steep dives for maximum time on target. When used in all battle modes, be sure to steer clear of enemy fighters, pick the ground targets that are farthest away from the usual dogfight zones, for example, the far left base on Alternate History Krysmk has plenty of targets and is seldom visited by Russian aircraft. One of the first weapon modifications you can unlock are torpedoes, a weapon which while seldom used, can turn a very quick profit when aiming for a light cruiser, destroyer or a Japanese aircraft carrier (as British and American ones are far more difficult to sink). With that, you can quickly grind down the payload line until you can carry your maximum ordnance. Once fully upgraded, choose your payload based on your skills in bombing and rockets. If you find you're better at rockets, load Tiny Tims and aim for heavy targets once your HVARs are used. Otherwise load up the 3,000 lb of bombs and obliterate any position you feel. The Skyraiders have a surprising level of maneuverability when they are clean of their ordinance. When engaging keep your energy at all cost, because if that AD dumps his load, all he has to do is drain you of your ability to run to be able to gain the advantage and take you out. The piston-engine Skyraider was designed during World War II to meet United States Navy requirements for a carrier-based, single-seat, long-range, high-performance dive/torpedo bomber. It was equipped with the 2,700 HP Wright 3350 Duplex-Cyclone Engine, the same engine that equipped to the B-29 Superfortress Bomber. It was designed to replace the Helldiver and the Avenger torpedo bombers as the Navy's primary attack craft. Unfortunately, it didn't serve in WWII due to the program being delayed. It went on to serve with distinction in later wars such as Korea and Vietnam. This page was last edited on 24 March 2019, at 10:37.